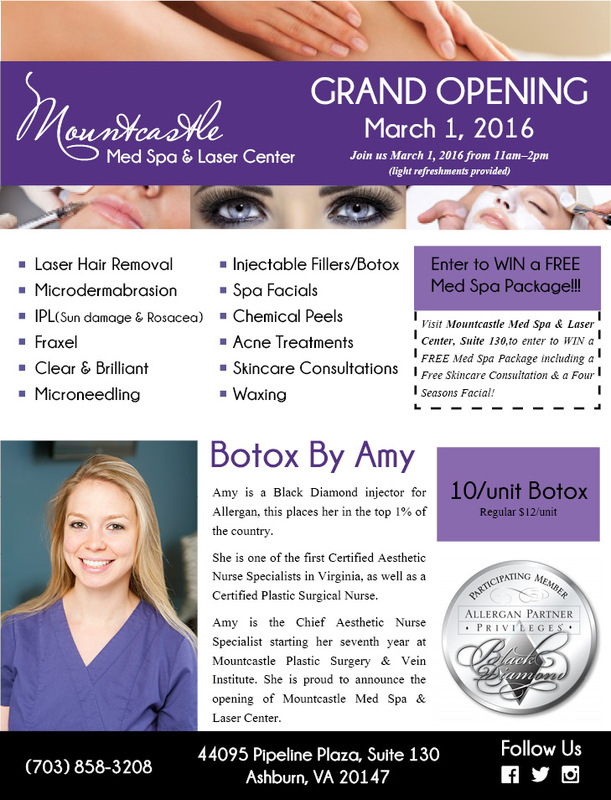 Mountcastle Plastic Surgery & Vein Institute is proud to announce the grand opening of Mountcastle Medical Spa & Laser Center, located at 44095 Pipeline Plaza, Suite 130 in Ashburn, Va. Mountcastle Medical Spa & Laser Center will feature a variety of top of the line skincare treatments, laser procedures, and Botox by Amy. At Mountcastle Medical Spa & Laser Center, Amy Herrmann, Chief Aesthetic Nurse, and Maria Foster, Medical Aesthetician, offer a variety of treatments and procedures to give their patients rejuvenated skin with a renewed youthful, healthy glow. At Mountcastle Plastic Surgery & Vein Institute, Amy has been overseeing the Med Spa since 2009. She has performed thousands of Sclerotherapy, Botox & filler injections, and facial rejuvenation procedures. Through the multitude of injections performed, Amy has advanced our practice to Black Diamond Status with Allergan, an exclusive status only awarded to top accounts. Maria has more than eight years of experience in the Aesthetic field as a Laser Technician and Cosmetic Consultant. Maria specializes in personalizing procedures for every patient, offering the best products for skincare. At Mountcastle Plastic Surgery & Vein Institute, located in Ashburn, Virginia, Dr. Mountcastle and his highly trained staff are committed to delivering the best possible results to their patients. 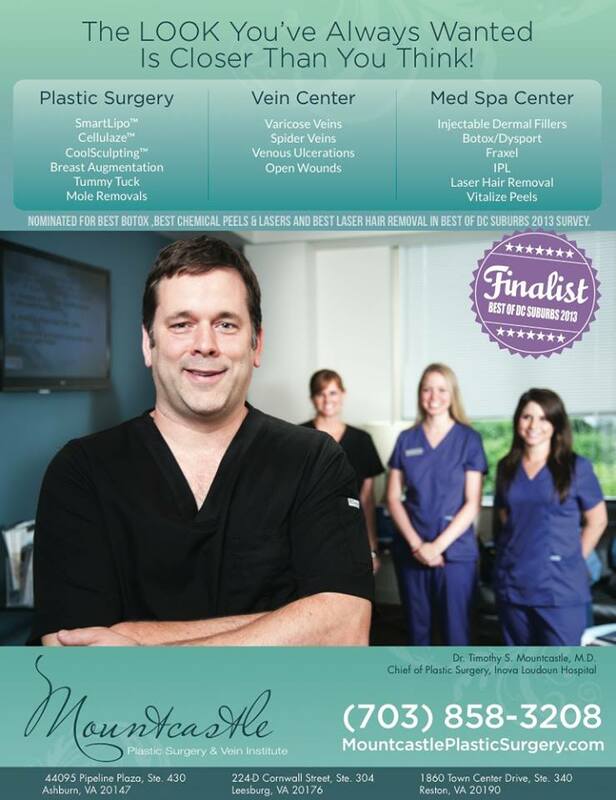 Dr. Mountcastle was recently voted Loudoun's Best Plastic Surgeon in The Loudoun Times-Mirror and Northern Virginia Magazine's Top Plastic Surgeon for 2016. Amy Herrmann has been collaborating with Dr. Mountcastle for the last seven years providing outstanding customer service and medical expertise at Mountcastle Plastic Surgery & Vein Institute. For more information regarding the procedures offered by Mountcastle Plastic Surgery & Vein Institute and Mountcastle Medical Spa & Laser Center, please visit the Mountcastle plastic Surgery website. Connect with us on Facebook, Twitter, and Instagram! Connect with Mountcastle Medical Spa & Laser Center on Facebook,Twitter and Instagram! Look for Mountcastle Plastic Surgery & Vein Institute and Mountcastle Medical Spa & Laser Center offers on Best of Groupon!